NOT IN A SUB-DIVISION! Run your business from home on this great 71.34 acres. Put these great buildings to use. Was a former dairy. Great property to board & raise horses. Possible other uses: beekeeping, nursery,bison,RV storage, autobody, livestock, manufacturing, trucking, welding, etc. 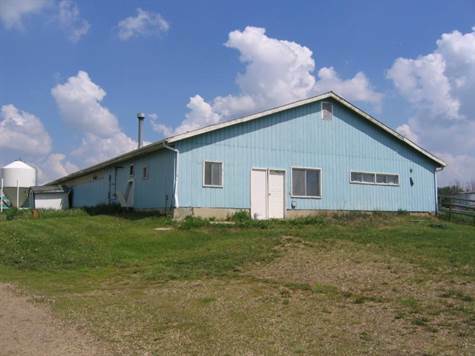 The buildings : 48x208 ft metal clad & heated with 40x80 ft addition & 25x33 ft addition; heated shop 30x53 ft; pole shed 24x72 with 18x72 ft lean-to; 16x32 pole shed with concrete floor. House is well maintained & has new septic (2011) at a cost of $25,000 & new vinyl siding & new deck. Has a million gallon dugout which could be stocked with trout. GST will apply on sale. Take Hwy 2A south of Leduc to Hwy 616 & go east 10 miles to RR 232 & south on RR 232 for 2 miles to TWP 480. Legal description SW-S2-T48-R23-M4.